During a severe thunderstorm early Tuesday morning, lightning apparently struck a house in Frankfort, Ky., sparking a fast-moving fire. James Meadows, his wife and two grandchildren were fast asleep at the time. 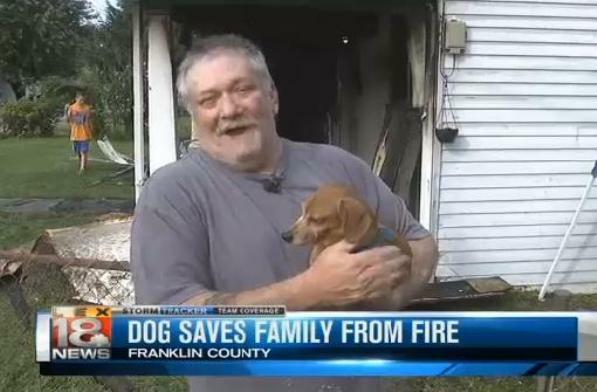 But thanks to Lacy, their 6-year-old rescued Dachshund, the family lived to tell the story. Meadows was able to get his two-legged family members and two of their three dogs out of the house before it was engulfed by flames. Tragically, the third dog did not survive. A GoFundMe.com account has been created to help the Meadows recover from the loss of their house. To make a donation, click here.